Next week is National Teacher Appreciation Week! Mark your calendars and shout out a thank you as you head through carpool line. If you want to do a little more to show some appreciation, you can borrow my idea. 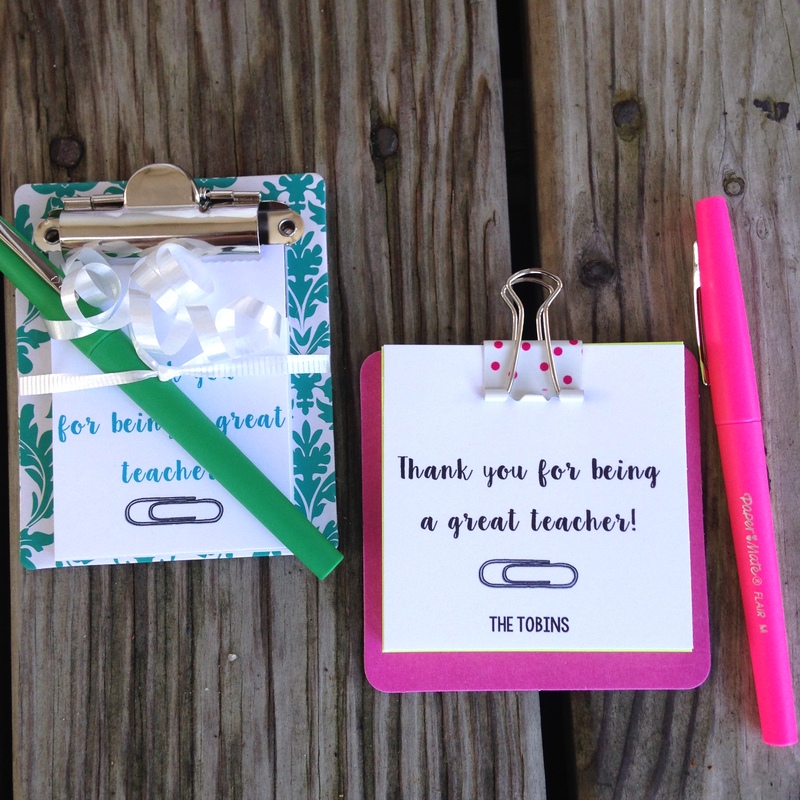 I always try to put together a small thank you gift for all of my children’s teachers, so they know that I do recognize the work they do each day. This year’s teacher appreciation sirsee is not too grand but remember that it does not have to be big or showy (or expensive) to be enjoyed. The purpose is to let educators know that their work is noticed. 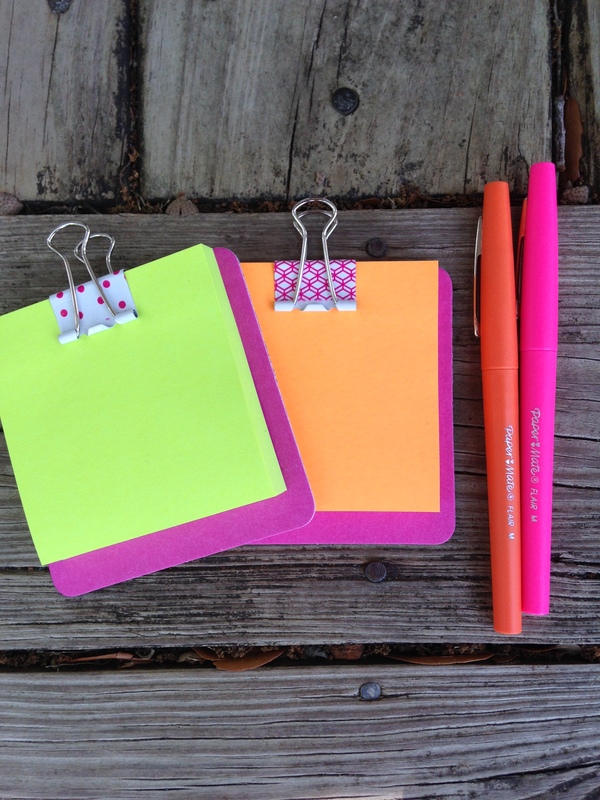 My kids and I made mini clipboards for Post-it notes and added Papermate Flair Pens in fun colors. Teachers go nuts for the Flair felt tip pens and even if they don’t have a pen preference, all teachers use marking pens and Post-it notes, so I am fairly confident the gift won’t end up in the trash. Remove the back paper from a Post-it notepad. Center the Post-it to the top edge of the coaster. Press the Post-it and attach. 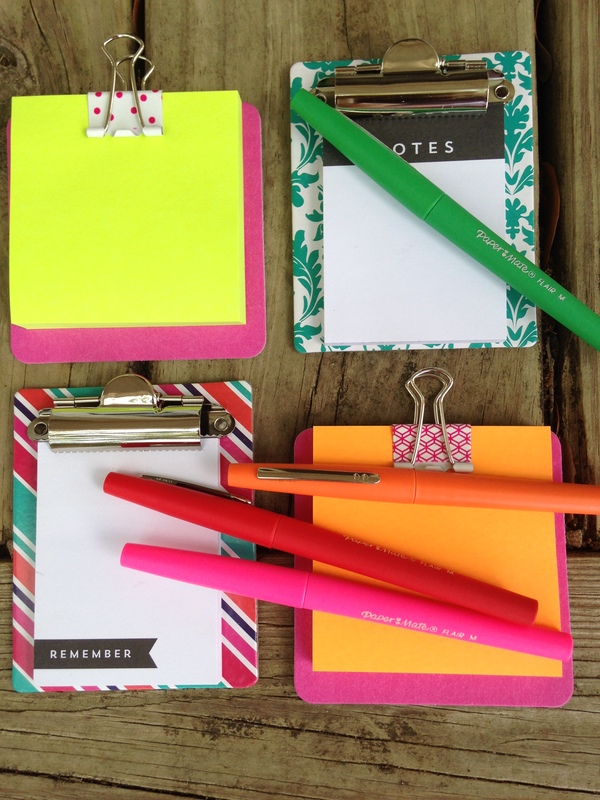 Add binder clip to the top of the coaster and Post-it notepad to secure. Leave the “handles” folded up. Print a message for the top page. 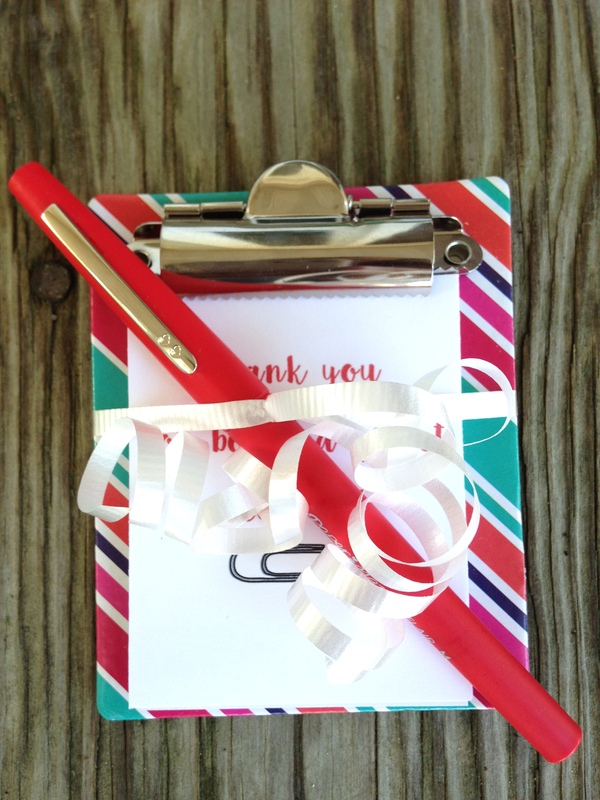 It is possible to print on Post-it notes and attach as the top sheet of your notepad gift. Use THIS TEMPLATE for a Post-it message. For complete directions for printing on Post-it notes, CLICK HERE. Tie curly ribbon around the middle and slide a pen under the curly ribbon to complete the gift set. You can use coasters with cork backing too. I had a really hard time finding coasters that were not made of stone and super thick. They can be ordered online, or you can visit your local watering hole and ask if they will donate to your teacher appreciation cause. The cardboard coasters are easy to cover with scrapbook paper, and then you can choose your color scheme. While we were on the coaster hunt, Miss Priss found mini clipboards with attached notepads and a magnet back at Michael’s Crafts for $2 a piece. We bought every one they had and supplemented with the few pink cardboard coasters I did find. 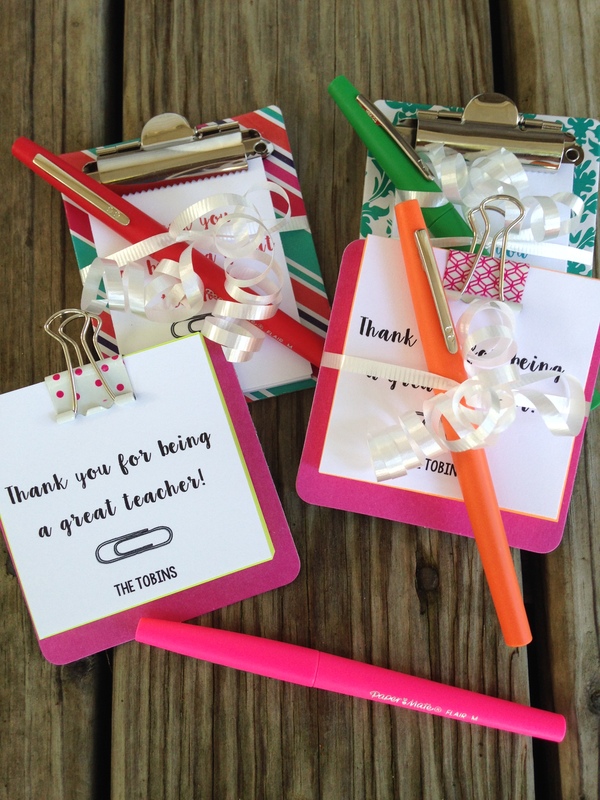 For more teacher gift ideas I have used in the past, CLICK HERE. Your kiddos’ teachers are very lucky! We are lucky. My kids have always had great teachers! Thanks for reading– hope your year is going well.